Does your pet suffer from itching and scratching or a skin complaint? It could be related to the food that they are eating. If your house is flea empty and you have tried every potion there is going perhaps it is time to give their food a new approach. A lot of foods can set off allergies in your cat and dogs which causes itching and scratching. You can read more about this in our blog post ‘The truth about cat and dog food’ just click here. Proudly made in the UK, Symply uses 100% natural, healthy ingredients with no artificial colourings, flavours or preservatives. Also containing a high level of Omega 3 for a healthy skin and coat, Symply has a high meat content for a greater taste that your fluffy friend wont be able to resist! The Symply team really do know their stuff. With over 40 years combined experience in filling the bowls of loved and pampered four-legged friends all over the country, they have now achieved their ultimate goal – creating their very own ‘perfect’ range of dog food and cat food. Using only the best possible natural ingredients, Symply will help your dog or cat grow into a healthy, happy life-long companion. Symply have an in-depth understanding of the common problems dogs may suffer (for example, itchy skin and dull coat, intolerances to certain foods leading to tummy upsets, extreme hyperactivity and associated misbehaviour) these problems have influenced the choice of every ingredient in a bowl of Symply dog food. All of these conditions (and many more, besides) can be prevented with a diet of natural and healthy foods. All the ingredients found in the Symply range of both natural dog food and cat food have been carefully chosen for their health benefits – like their salmon which is sourced from the Highlands of Scotland, rich in Linoleic Acid (Omega-6). Linoleic acid is an ‘Essential Fatty Acid’ that has many important roles in the body including the maintenance of healthy skin and coat, ensuring normal growth in kittens and puppies. Symply use Great British meadow-raised lamb, a meat more gentle on the stomach for dogs who suffer from upset tummies. Each and every ingredient carries out an important task and is the healthiest possible option for that specific job. Symply do not participate in any animal testing and do not use any artificial colours, flavours or growth hormones. If your dog has weak joints or is now in their senior years you will be happy to know that amongst Symply’s top ingredients is a very generous helping of 3 types of great joint care: Glucosamine, Chrondroitin and MSM. 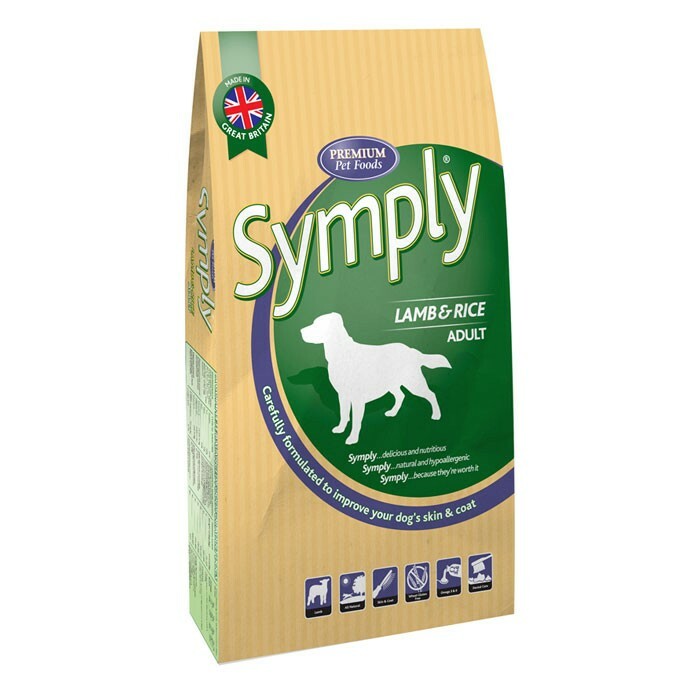 If you are looking for a new natural dog food or perhaps your pet suffers from itching, scratching, intolerances or other similar conditions, switch to Symply – they absolutely guarantee results. Pets Corner will happily give you your money back if you are not 100% satisfied with this product. My dog has suffered from a skin condition most of his life. I have spent hundreds of pounds on him at the vets for injections and on foods that didnt change his coat condition in the slightest. When I heard of Symply – I was reluctant to try it. It was very lucky that I did. Sam’s coat is in a wonderful condition, people even comment on his coat now. Not only that he seems happier in himself, he can now climb the dreaded stairs and has a new appetite for life. Extremely happy with this choice in food! If you would like to see our full range of Symply, please click here. Or you can visit their website. Otherwise please do not hesitiate to visit one of our stores for more information. You can find your nearest store by clicking here.